The sun finally greeted us, and as soon as it broke 20 degrees me and my yoga mat traveled outside for some much needed vitamin D. After a solid routine, my muscles (and pale skin that hasn't seen sunshine in months!) needed a bit of a break, and Inner Senses stepped in with a solution that soothes aches and smells divine: their 100% natural Active Body Oil*. Inner Senses is entirely a plant based range that is cruelty free, organic, and vegan, and going by the quality of this single bottle, they have truly mastered the art of oils. With twenty years of experience, the brand has had time to fine-tune their blends to ensure perfection. And each of their products (and there are over 30 of them!) is hand made, meaning personal care goes into each and every one. I knew I needed to try out Inner Senses, and so have been looking for an opportunity to do so for many many months. After my March spending ban, I decided it was time, and thanks to the LLABP I was able to finally experience the magic myself. 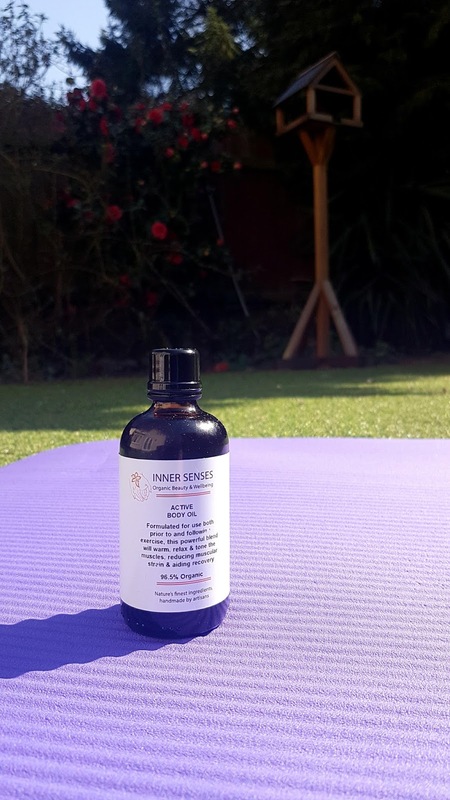 This body oil is actually perfect for pre and post workout, as it can warm up your muscles and stimulate circulation as well as restore strains and aid recovery thanks to the six essential oils within the blend. One of the main heroes in the formula is black pepper, an oil that actually used to be considered sacred and was used as a form of payment back in ancient times. This essential oil is powerful stuff, as it helps reduce spasms and pain, improve circulation, remove toxins, and protects against damage from free radicals. Pair this with the additional benefits from ginger root oil, rosemary leaf oil, eucalyptus leaf oil, marjoram leaf oil, and juniperberry fruit oil, and you have a truly magical potion. I have been using this primarily on my lower back after yoga, but also on my calves after some of my longer walks or more strenuous work days, and it starts to warm and soothe straight away. Recently, I have also been having some issues with my hands, and a little bit of this helps ease the pain. I have to say, I am hooked on this Active Oil, and am so happy I have found such a powerful product. The oil itself is rich without being thick or heavy, and it sinks into the skin well. I like that it doesn't leave a slick feeling or a greasy residue, and it is gentle enough that my sensitive skin hasn't broken out in spots. It's a true winner for me and I have nothing but love for this product! 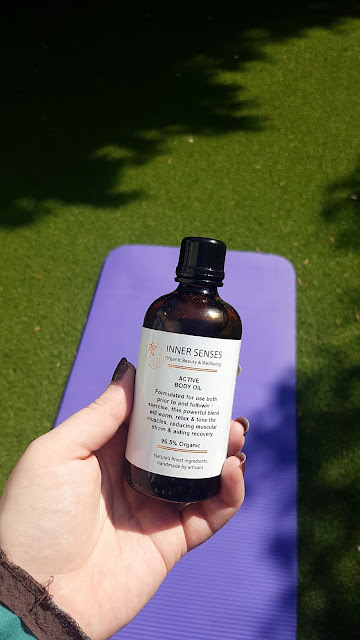 Inner Senses Active Body Oil comes in a 100ml glass bottle, and since a little goes a long way I anticipate this item lasting me several months at least. And at just £9.95*, this is probably the most cost effective product I have come across in a long time. Will I be rebuying? Most definitely. Will I also be looking to try more from InnerSenses? Of course! 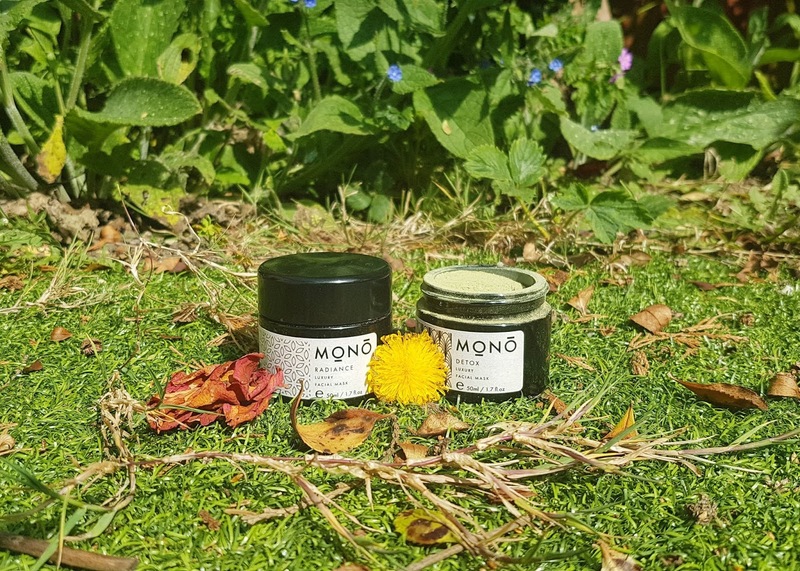 If you are impatient and can't wait for me to buy and try more from this lovely organic brand, you can always head over and read the fabulous Renata's review over at Green Life in Dublin! *** UPDATE -- As you lovelies may know, I am now an Ambassador for Inner Senses, so if you are looking to buy any of their amazing products you can grab a sample size bottle of any blend with a full size purchase over on their website by using code BRYANNA -- no minimum spend required, and samples range from £3.25 to £10 across the face and body range so this is a great way to trial a blend you are not 100% sure about yet. You can find a rundown of all of Inner Senses products here to help you make your sample selection! This sounds fab! I've never used oils on my body before, it would be great to feel less achy after the gym. I have reviewed some Inner Senses oils too, and they are so lovely, especially the Awakening oil, which is not carried by Love Lula sadly. I was looking at this, and now I wish I had gotten it, but there is still time, isn't it xo Glad to hear it is working well for you, I hope it will help my hubby with post work body aches. Oooh this oil sounds absolutely amazing, I'm definitely the kind of person that doesn't like an oil that isn't heavy, as I don't want it to leave my skin feeling greasy! Sounds great, I love body oils. 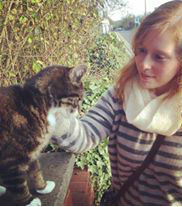 I do yoga too, and can't wait for the weather to warm up again so I can practise outdoors.